- Go to each MIDI SLOT A, B, C and D track and check the G1 Slot Relay device is loaded in the Device View of each track. - If everything is loaded correctly, you can fold the “Setup” Group track for a better view. The Live setup contains a Main Group that contains Tracks and another sub-Group for Setup. - Unfold the Setup Group. In the "SYSEX" track, set the Midi Input and Midi output of the track to the corresponding PC IN and PC OUT ports of your Nord Modular. - For each MIDI SLOT A, B, C and D, set the inputs and outputs ports to the same MIDI Channels they are set in your Nord Modular settings. - For each MIDI SLOT A, B, C and D, set the corresponding Slot in the G1 Modular Relay device. In this example, the "Relay" device set to SLOT B is placed in a MIDI track where the MIDI Output is set to the same MIDI Channel as the SLOT B defined in the Nord Modular synth settings. - Set the right Audio inputs in the G1 Audio track in order to receive the audio signal from the Nord Modular. If you use multiples outputs from your Nord Modular, create as many tracks as needed within Ableton Live. To map the knobs of the G1 Controller to your hardware controller, enter MIDI Map Mode in Ableton Live, click the G1 Controller device’s knob you want to affect and immediately turn the actual knob from your physical controller. Ableton Live must have been configured to accept MIDI messages from your controller. See in the Live Preferences and check that the Remote button is enabled for your hardware controller (Preferences > Link/MIDI). Please refer to the Ableton Live manual for further details. In MIDI Map Mode, any blue item in the device is assignable. will transmit to the Nord Modular. In order to use this panel of knobs easily, try to always use the same CC numbers between your patches. 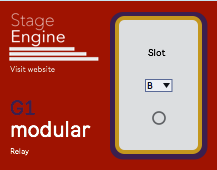 This way, the 18 knobs of the Stage Engine G1 Controller will always have an influence whatever patch is loaded. The CC Numbers you define in the G1 Controller configuration must correspond to the CC Numbers in the Parameters column of the Nord Editor mapping dialog window. - The CC numbers will be remembered by saving the Live set. - Turn on your Nord Modular. The panel should now display “Loading...”. Once finished, it should display the name of the first Patch of the first Bank. If it displays “Error” refer to the Troubleshooting section at the end of this manual. - Also check into the setup panel that the SYSEX IN led is blinking. It means your synthesizer is talking to the G1 Controller. If it’s not the case, check that the SYSEX track in Ableton Live is configured correctly (See 2.1 Installation in this manual). - Load a patch in Slot A of the device. Send midi notes from your keyboard by routing them through the MIDI SLOT A track in Live. Check that you can hear what you play. If not, check your physical MIDI connections and the MIDI routing in Live (see 2.2.1 Routing section of this manual). Be sure the Audio routing is also well configured. Refer to Ableton Live manual for Audio routing.